Vo Ta Hung was born in Hà Tĩnh Province in 1955. He studied at the Hanoi Industrial Arts College in their Monumental Art Department. 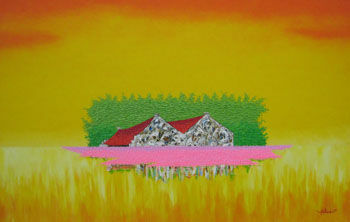 He is currently a member of the Vietnam Fine Art Association. Vo allows the viewer to enter his unique imagination where his utopian vision of Vietnam thrives. He engages the viewers in an intriguing mystery, where viewers have to fill in the blanks and weave their own stories about each piece. By enthralling his viewers with a sense of the mythical and a sense of surrealism, the intellectual is provoked and stimulated to form fables in an enjoyable process of thought. Regardless of the story, all his pieces feature an extraordinary use of texture, and the mystery of the technique heightens the allure of each piece. The pieces are normally devoid of human elements and if present, are diminutive compared to the vast landscapes. His canvases are flooded with brilliant, rich hues that instantly captivate viewers and introduce a jolt of cheer into any room. In some pieces, the red skies are intense and fill three-quarters of the canvas, in sharp contrast with the butter-yellow, three-dimensional fields of rice or floating lotuses. His mastery of composition and colour harmonises the contrasting elements in stunning works that make a colourful impact, yet exhibit tranquility. Vo extends a personal invitation to his viewers, where the fantasia of Vietnam is a welcoming, surreal experience. Underpinning his works is the message that simplicity is poetry and the root of our everyday happiness.